One of the great affordable vanity solution that does not only comes with styles but also superior quality and sleek finish. 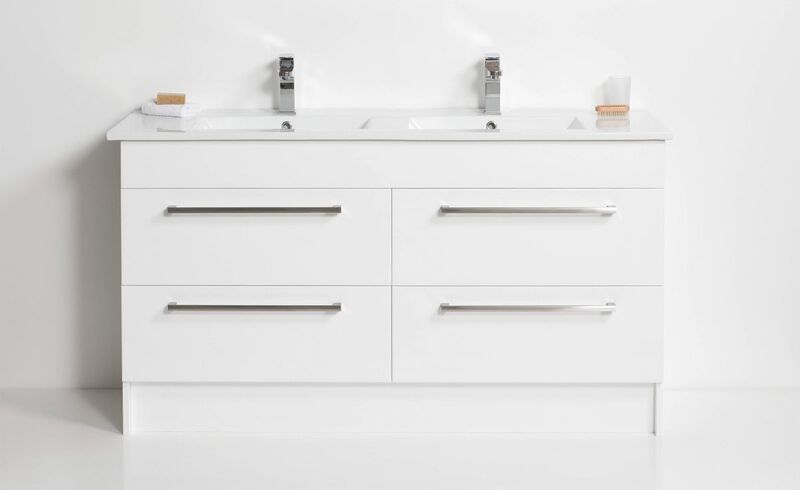 The Zara vanity features a modern slim top with half-circle dip basin that ensures water flow smoothly to the waste yet gives a touch of modern style to your bathroom. Features a modern slim top with half-circle dip basin that ensures water flow smoothly to the waste yet gives a touch of modern style to your bathroom. New depth in drawers offers convenient storage space for all your daily essentials. Vanity comes with Box Handle (H1). Available in White Only – Our paint is achieved through our high-tech paint layering process, using polyurethane or UV based paint. It is five times more durable than lacquer finishes and the only process of its kind in Australasia. A finer grade of ceramic materials fired at a higher temperature to form a non-porous body, exposed surfaces are coated with high-quality glaze fused to the body that creates a beautiful high gloss shine. Every top is unique due to the firing process. Please choose carefully – Outlet items are either ex-showroom models, seconds with minor faults or end of line. All Outlet store item sold are non-returnable or refundable and no warranty. We strongly encourage you to visit our Auckland Outlet Store showroom to inspect the item before purchasing. Payment can be completed through online banking OR Eftpos in store. Please arrange collection within a week from the Auckland showroom. Bath Co are not able to store items or organise delivery.